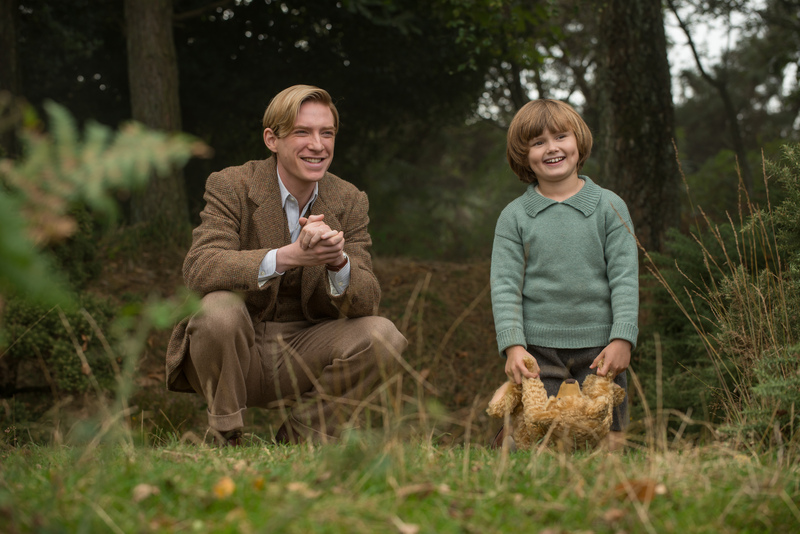 The new biopic by Simon Curtis, Goodbye Christopher Robin, joins other films (including the coming-soon The Man Who Invented Christmas) about authors, giving us the story behind the most popular children’s books in the English language, Winnie the Pooh. A.A. Milne (Domhnall Gleeson) returns from the front lines of France after World War I a broken man. Suffering from PTSD, he can’t produce the comedies he once wrote for the London stage. Needing to get away from the noise of London, Milne moves his wife, Daphne (Margot Robbie), and young son (Wil Tilston) to the countryside of Sussex. They call the boy “Billy Moon,” but his real name is Christopher Robin. Having wanted a girl, Alan and Daphne left Billy’s raising mostly to the nanny, Olive (Kelly Macdonald). Wanting to write a book that will convince people war is not the answer, Milne takes his time ruminating over the idea, much to the disgust of Daphne who ups and leaves for London, telling Alan that she’ll return when he starts writing again. The absence of his wife allows Milne to spend more time with Billy, taking walks in the woods that surround their home. Billy talks constantly, drawing some gentleness and playfulness out of his normally reserved father. The more time they spend in the woods, the more Milne is convinced that he’s supposed to write a children’s story to bring happiness into people’s lives. Initially named Edward, Billy changes his teddy bear’s name to Winnie after visiting the real Winnie, a bear at the London Zoo. Together with Eeyore, Piglet and Tigger, the Winnie the Pooh stories begin taking shape. When Daphne returns from London, she brings Kanga and Roo as a gift for Billy (Owl and Rabbit only ever existed in imagination). Since the Milne’s have never called Billy by his given name, Alan figures he could use it as a name for Winnie’s human friend, Christopher Robin. When the book is published it flies off shelves and the fame goes not to Alan but to Billy as the “real” Christopher Robin. In demand for public appearances, Billy’s parents make him available to all comers garnering financial gain. Billy hates all the attention and gets bullied for being Christopher Robin. As Christopher Robin’s fame spreads, Alan becomes withdrawn, no longer playing with Billy in the woods. As Billy longs for anonymity once again, all he wants is to spend time with his father. It’s only when Billy grows up and enlists as a private in the British Army during World War II, does the rift between father and son begin to heal just a bit. Goodbye, Christopher Robin, as the title indicates, is about the disappearance of childhood for this boy who just wanted to be a kid. His childhood was unexpectedly ripped away by unwanted fame. The film is really about family and fame and how the two didn’t mix well for the Milne family. Billy felt betrayed that his innocent imaginings were taken by his father and given to the whole world. That the world loved them so much was not Billy’s fault. I grew up with the Disney version of Winnie the Pooh (yes, and Tigger, too!) so I’m very eager to find the original stories and read them myself and expose my young nephews to them. While Goodbye, Christopher Robin is a bit of a sad story, I think it can be a great inspiration for parents to encourage their children’s imaginations. Imagination is a great thing and in today’s world dominated by electronic sounds and images, allowing kids to let their imaginations run wild is a healthy thing to do.